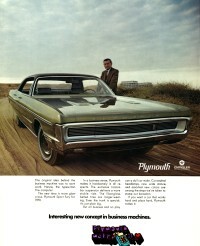 Style-wise, the Plymouth full-size models were most visibly changed up front for 1970. The grille was now surrounded by a loop-type bumper and Sport Fury models added concealed headlights, a new feature for Plymouth. The hood on all models featured two longitudinal bulges each of wich could carry the optional external turn signal indicators. In the rear, the tail lights were now also housed recessed in a more massive looking bumber. The trunk lock was relocated to the right for a cleaner and innovative look. The lineup had also undergone some changes. 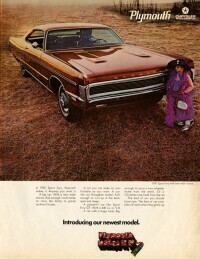 The VIP models were gone for good, but a Brougham upholstery package was available for the Sport Fury. 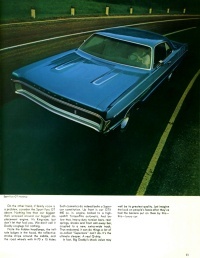 The Sport Fury was also avilable in "GT" trim. The GT was a muscle car with full size dimensions and featured a strobe stripe decal at the belt line, hood decals and square chrome exhaust tips to show it can really do. The 1970 GT's standard engine was the the 440 cui V8 engine with 350 hp, but a 440 cui powerplant with Six Pak carburetion and 390 hp was optional. 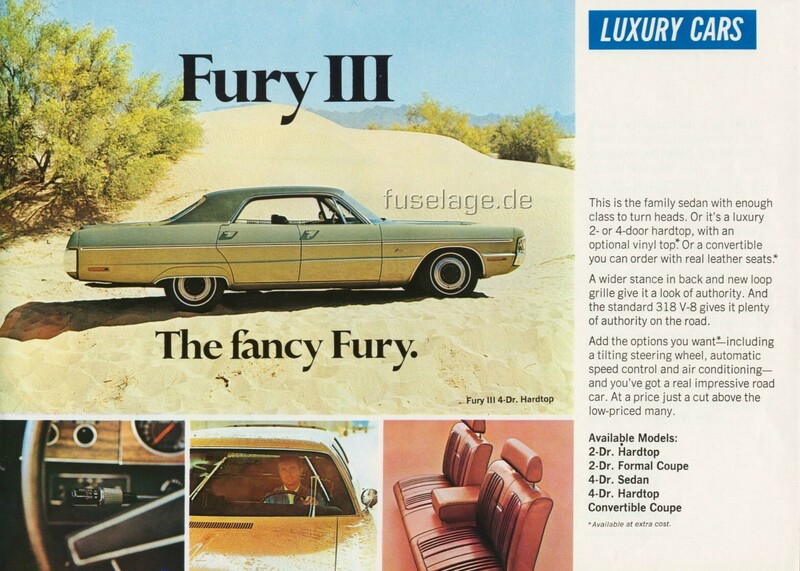 Just below ranged the Fury S/23 which had the same optical modifications as the GT, but came standard with a 318 V8. While the GT and S/23 were only available as a two-door hardtop, the regular Sport Fury was available as a two- and four-door hardtop, four-door sedan and as a wagon called the Sport Suburban. It wasn't available as a convertible, though, which was only offered in the Fury III line. 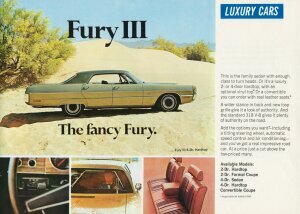 Below it ranged the Fury II and Fury I series which offered a two-door sedan but no hardtop models. Again this year, there were two different roof lines to chose from for the two-door hardtops. The somewhat sleeker "standard hardtop" and the "formal hardtop" which shared the basic roof sheetmetal with those of the four door hardtops. Station wagon buyers could chose between the Fury Sport Suburban, Custom Suburban and Suburban. While the Fury I and Fury II came standard with the slant six engine, they could also be had with more powerful powerplants, up to a 350 hp 440 cui V8. 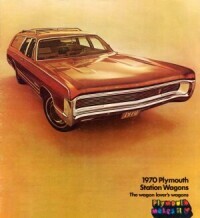 There was a separate Plymouth station wagon catalog in 1970. Click to see the Fury/Suburban section of it. 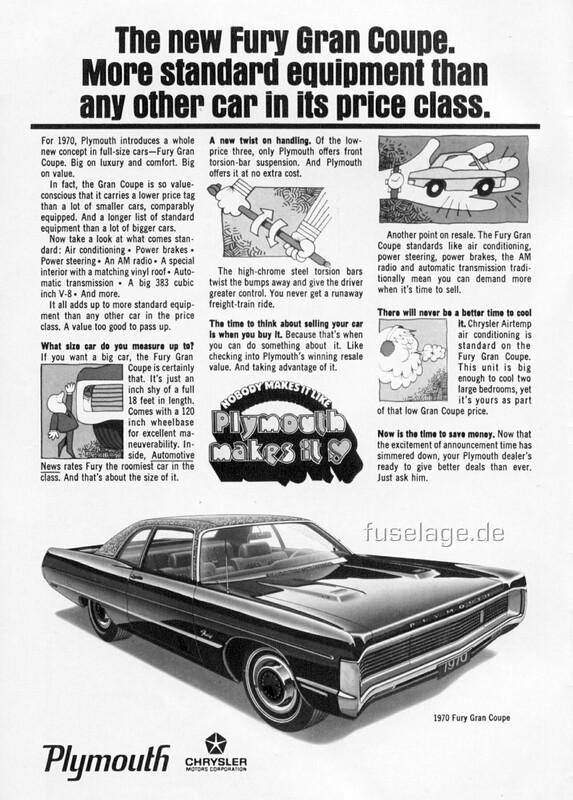 The 1970 Plymouth Police brochure shows how the Fury I sedan looked like in law enforcment trim and explains the special police fleet options. 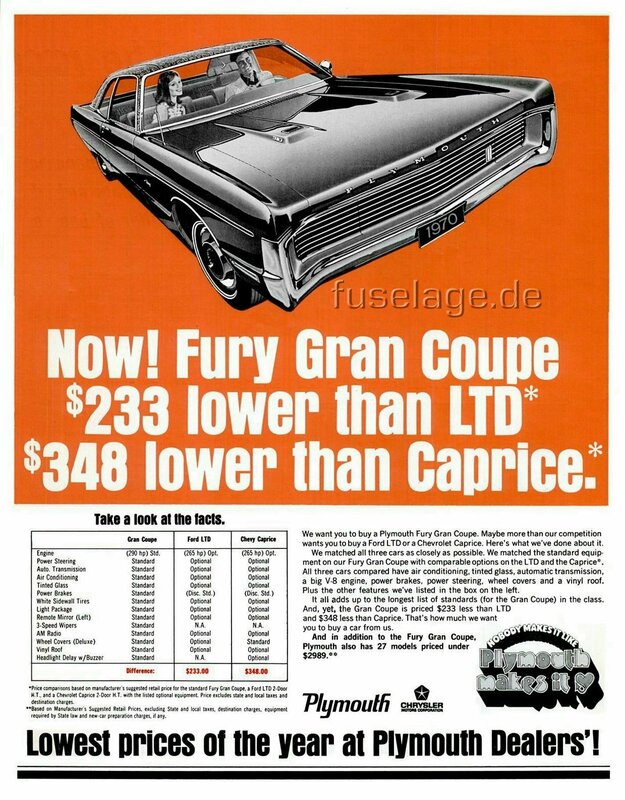 This is a magazine ad promoting the 1970 Plymouth Sport Fury. 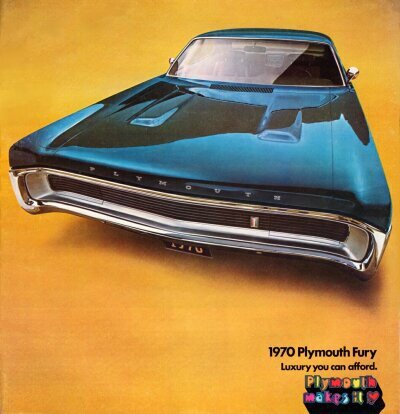 This is a huge three-page magazine ad promoting the 1970 Plymouth Sport Fury as well as the brand-new Barracuda. laid out flat, the perspective may seem a little odd, but when seen on paper it looks impressive. Another magazine ad for the 1970 Plymouth Sport Fury, this time a four-door hardtop. The selling point this time is the Fury being a "business machine". All work and no play? I don't think so! 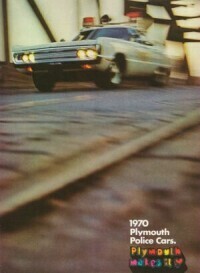 This is a page of the 1970 Plymouth Rapid Transit System brochure, aimed at the sport-minded, introducing the Plymouth Sport Fury GT. "Nothing less than our biggest shell wrapped around our biggest displacement engine." 'Nuff said! This nice picture of a 1970 Plymouth Fury III is taken from a special U.S. military sales catalog. 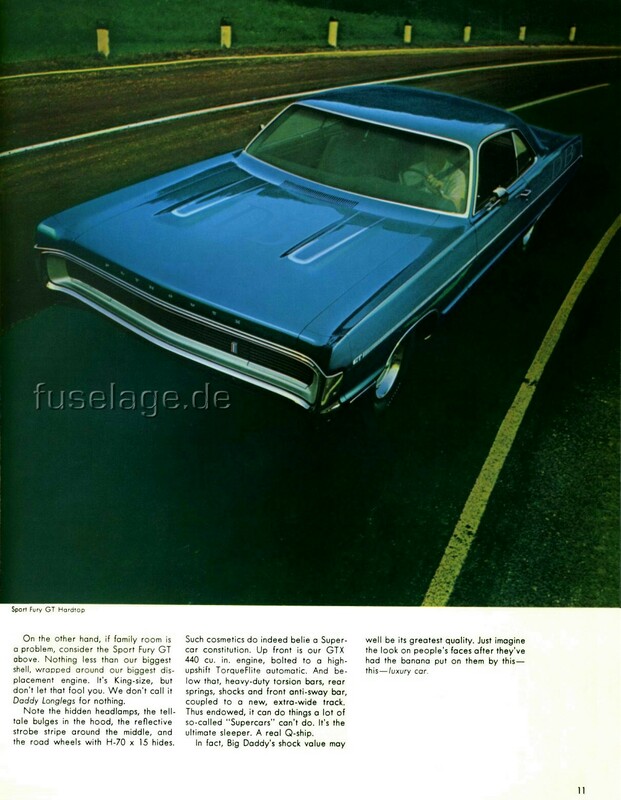 This color photo of a 1970 Plymouth Sport Fury four-door hardtop can be seen in the 1969 corporate annual report. 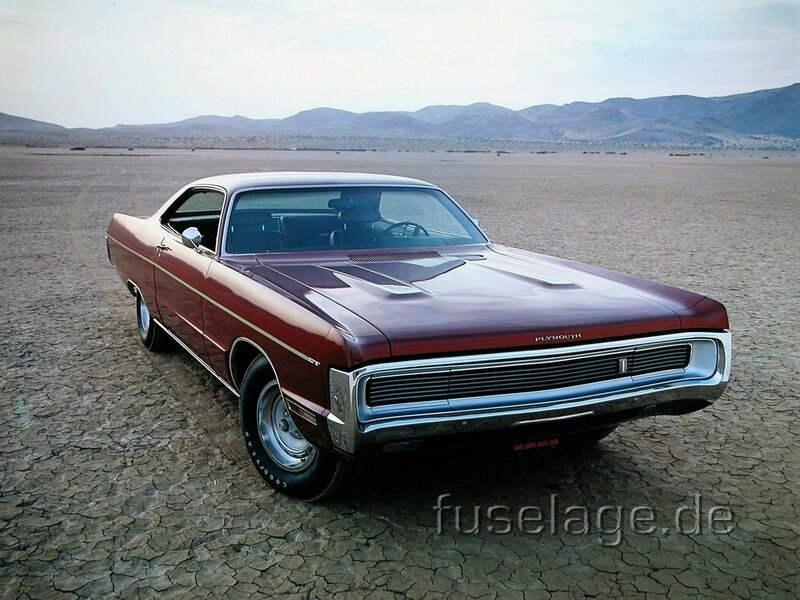 This color photo shows a pre-production copy of the 1970 Plymouth Sport Fury GT still sporting a 1969-style "Plymouth" script on the hood. 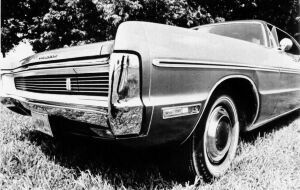 Spring of 1970 saw a new mid-year model called the "Gran Coupe". 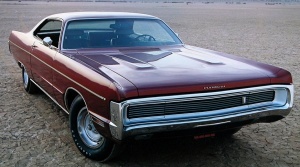 It was based on the 1970 Plymouth Fury II two-door sedan but had more standard equipment including air conditioning and the Sport Fury grille with its concealed headlights. 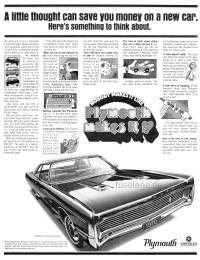 Most noteable were the vinyl roof and the interior upholstery with their Paisley pattern. Although most Gran Coupes had a copper tone paint, other exterior colors were available. 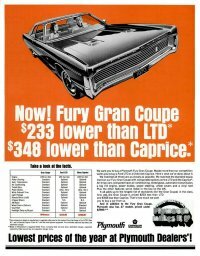 Here are three different ads for this model with two of them making direct comparison to the Chevy Caprice and the Ford LTD. 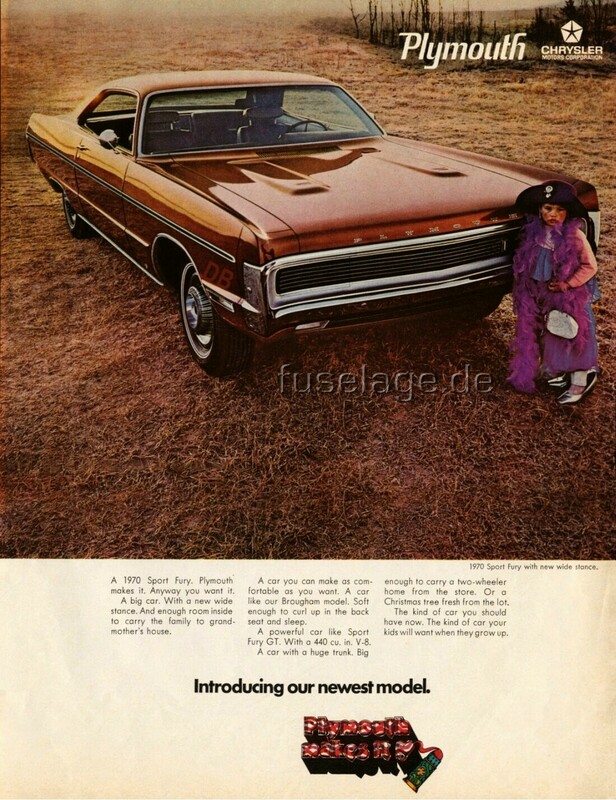 This is a press photo of the above-mentioned 1970 Plymouth Fury Gran Coupe. 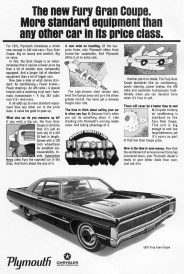 Read what »Car Life« associate editor Alan Girdler had to say about the new 1970 Fury in the division's own Plymouth Traveler customer bonding magazine. 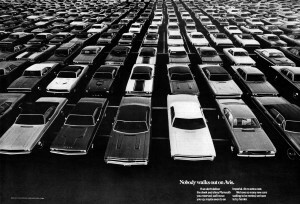 This is a magazine advertisment for AVIS rent a car promising to get you the Plymouth you reserved or to upgrade you. 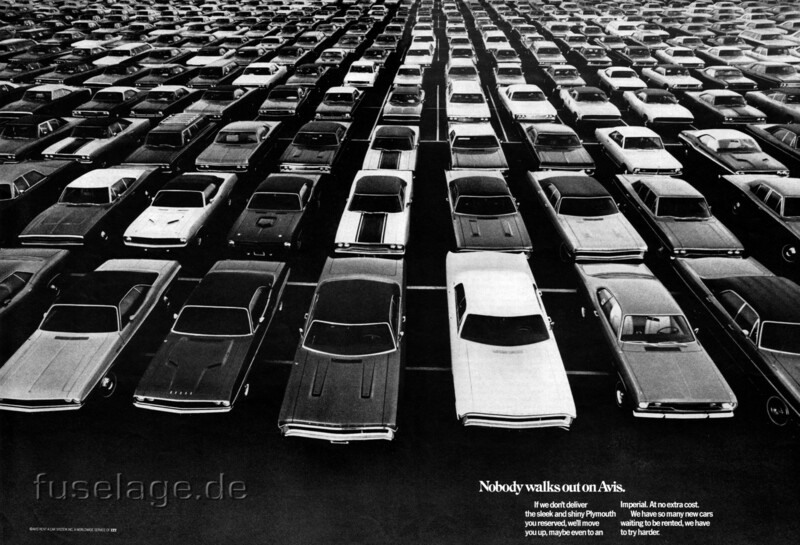 The entire lot seen on the image is full of cars made by Chrysler Corporation. Look at the two Plymouth Sport Furys up front.